designers - the result of seven year's gallery, museum, library, newspaper and field research. Superbly illustrated with over 1000 photographs, 600 in colour. 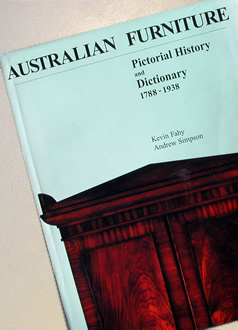 Australian Furniture: Pictorial History and Dictionary 1788-1938 is the most comprehensive survey of quality furniture, its marks and makers, yet undertaken in this country. A natural progression from the authors' previous works, Early Colonial Furniture in New South Wales and Van Diemen's Land (1972) and Nineteenth Century Australian Furniture (1985), this volume is designed to further assist in the accurate identification and dating of furniture made in this country prior to the outbreak of World War II. communities; and Chinese cabinet-makers, flooding into Australia in search of gold in the 1850s and 60s, who quickly adapted their traditions and skills to furniture making for a market with largely British taste.